A trio of U.S. Senators, 1967, at Maryvale School, in Baltimore County with black Catholic Oblate Order nuns. Frrom left to right: Joseph D. Tydings, Robert Kennedy and Daniel B. Brewster,all Democrats. Photo courtesy of the late Sen. Brewster, Blaine Taylor Archives, Towson, Md. This week marks the 50th anniversary of the murder of Sen. Robert F. Kennedy as he campaigned for the presidency. Towson author Blaine Taylor, who has a forthcoming biography of Kennedy, here reviews three books on Kennedy that came out this year. This is an outstanding work done with both newly released boxes of RFK papers in the John F. Kennedy Library and the blessings of widow Ethel Kennedy. He had Free State connections: in Baltimore taking speed reading, on Harvard’s football team defeating Western Maryland College 52-0, playing with a leg in a cast, then considering moving here to run for office. When his funeral train passed through Baltimore, Mayor “Young Tommy” D’Alessandro, brother of Nancy D’Alessandro Pelosi, led the mourners singing The Battle Hymn of the Republic. 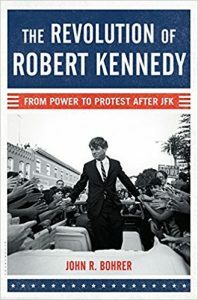 Richard Nixon said after RFK won the ’68 California Presidential primary, “It sure looks like we’ll be going up against Bobby,” and then tragedy struck. Tersely scripted, well narrated, this broad-based work also has a good selection of photos. The author details how his subject became in the 16 years of his public life a terrific researcher and executive supreme in both selecting and managing top talent. Today, Bobby’s old workplace in Washington is named for him: the Robert F. Kennedy Department of Justice, thus making him unique among both his predecessors and successors. Tye reveals that the honoree took voice lessons in 1964 before running for the U.S. Senate in New York, but never overcame having his hands shake while they were out of view beneath podiums, as observed by his aides. Bob Kennedy took too many risks in both public life and private sports: plunging into crowds and diving off sailboats in rough seas. Like him, two of his sons died too early in life as well as sadly. Perceived as too radical by his foes, Kennedy, like his assassinated brother John F. Kennedy, was actually a rather conservative politician by today’s standards, who favored incremental change over sudden upheaval. Like FDR, however, RFK alienated his own class, that saw both as traitors who would take away their wealth and privileges when elected to the Oval Office. They knew him well enough, Tye asserts, as he meant to do what he said, and they believed him. It’s very possible that his Operation Mongoose—meant to kill Cuban dictator Fidel Castro—may’ve brought on the 1962 Missile Crisis. Did it also help cause JFK’s murder in 1963? Bobby thought maybe so. New information reveals that maybe all the missiles weren’t removed after the crisis ended. This is a work well worth your time. This is a well-done, illustrated biography by MSNBC-TV’s Hardball host Chris Matthews. After the tough 1952 Massachusetts U.S. Senate race against incumbent Henry Cabot Lodge that Jack Kennedy won in an upset victory managed by RFK, the lasting bond between the two brothers was forged. He opposed President Lyndon Johnson’s Vietnam War, but that wasn’t what ended his life, however. Among his direct sources, Matthews counts widow Ethel Kennedy and his eldest child, Maryland’s own Kathleen Kennedy Townsend. The book has its humorous moments as well. In 1985, widow Ethel Kennedy met Polish Pope John Paul II in Washington, and he recalled, “I’ve met you once before! I made you a grilled cheese sandwich!” when she, RFK, and KKT visited Poland in 1964. 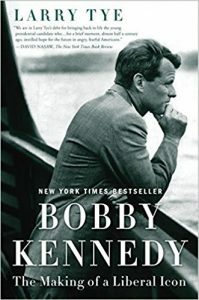 President Kennedy was gone, and Bobby’s hated Lyndon Johnson now sat in his chair in the Oval Office, wanting “little brother’s” input—but rarely heeding it—and not having him as vice president on the 1964 national Democratic ticket. D.C. pundits asked: What will Bobby do? That question is well answered in this gripping saga of RFK during 1964-66, concluding with his famous trip to black Africa. 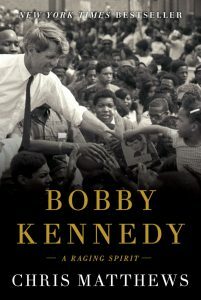 This reviewer hopes that there’ll be a second volume to cover Bobby’s final two years. His path was ordained by two realities: Barry Goldwater was badly defeated on the right in 1964, and winning LBJ was at the political center. Bobby could only go left, even though Johnson feared that he would veer right if he lost Vietnam to the Reds. Blaine Taylor, blainetaylor@comcast.net, has written numerous books of history, particularly about Nazi Germany, and is the author of the forthcoming biography, Bobby! From Robert F. Kennedy to RFK/A Life on the Way to Death, 1925-68. Taylor is also a repeat candidate for U.S. Senate, this year as a Republican. ← Who killed Bobby Kennedy?